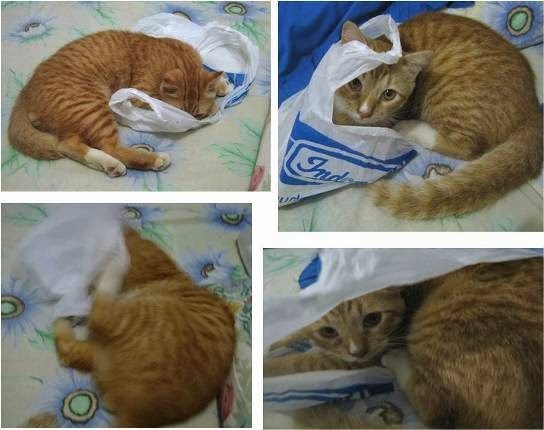 Our young male cat, Koneng, loves to play with bags, especially those made from paper or plastic. I captured a playing moment one night on our bed. Cats are playful, they make good playmates and they are good entertainers too whenever one is bored. 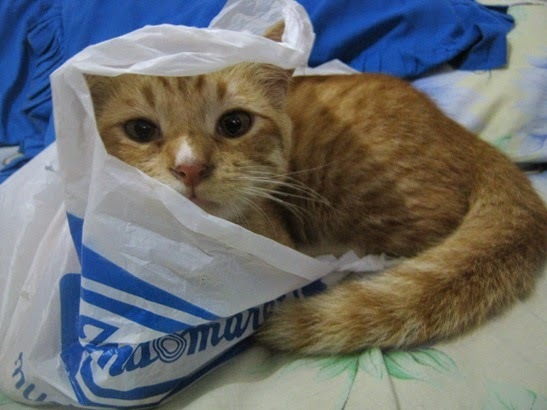 Cats are very playfull but my daughter's dog was suffocated on a plastic cereal bag one time he got into that cupboard during the night and they found him dead in the morning. Hello Lina, Koneng is a cute kitty. He does look happy playing with the bag. Thank you for linking up and sharing your post. Have a happy weekend! My dear departed friend Max used to like hiding in big brown bags, then come leaping out from ambush. I think they like the noise the bags make. I never leave a plastic bag out with my kitties without supervision. I'm always afraid they'll try to eat the bag! Happy Critter Day! Fun shots! He's very cute. Cats are so funny the way they like to climb into stuff. Koneng is having a ball!